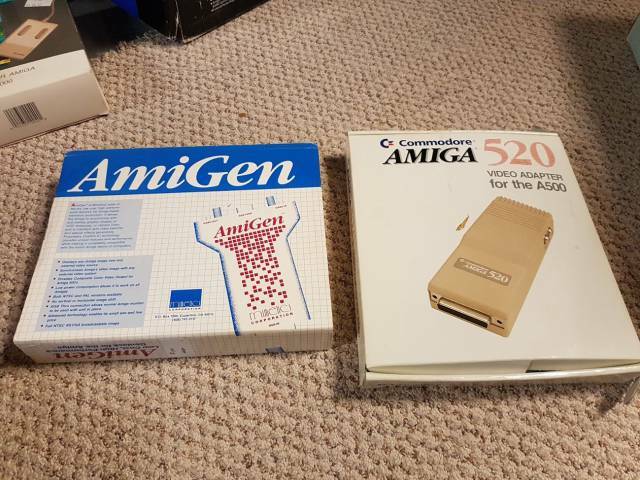 "I had an Amiga 2000 HD back in college in the early 90s and was hoping to find a small Amiga to use again. 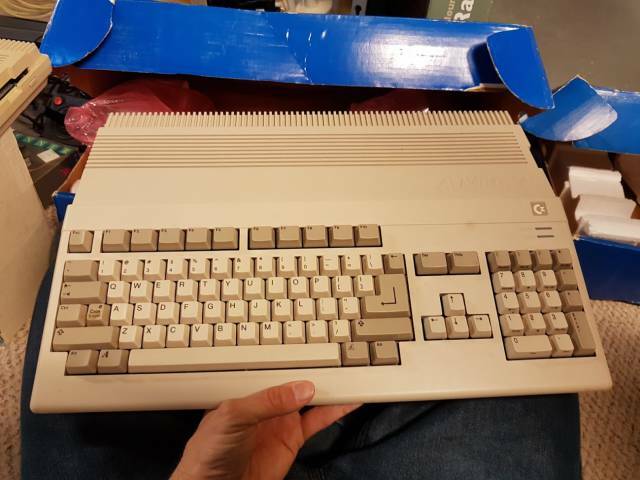 This was advertised as two Amiga 500 computers, a monitor and some accessories so I went and picked it up. 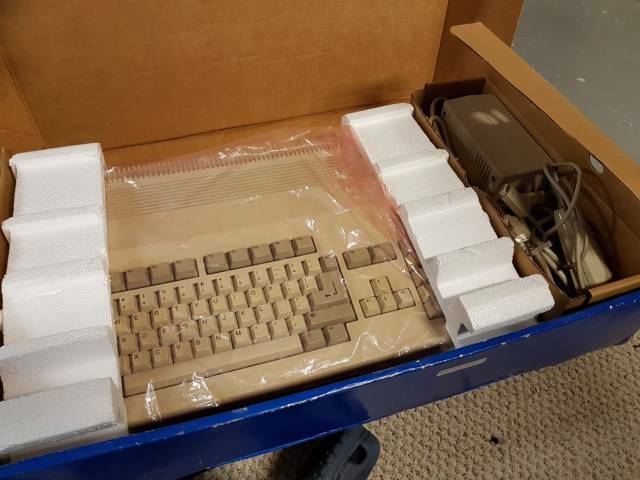 Was surprised that the computers and monitor were boxed. 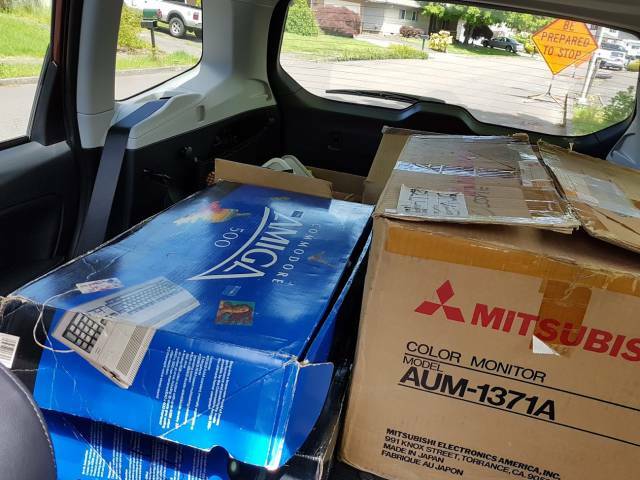 Here is a snap of everything loaded into my car." 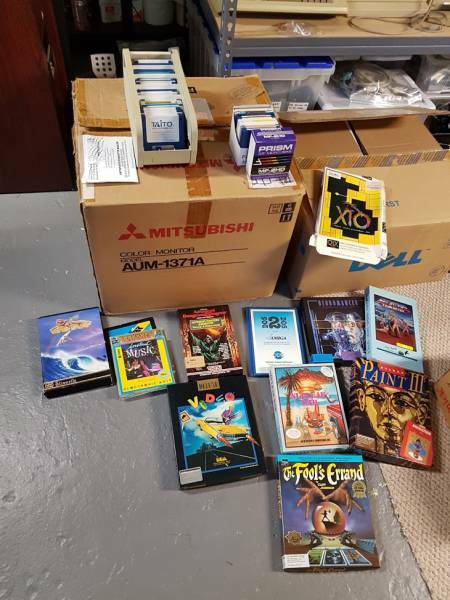 "Starting to sort through the stuff. 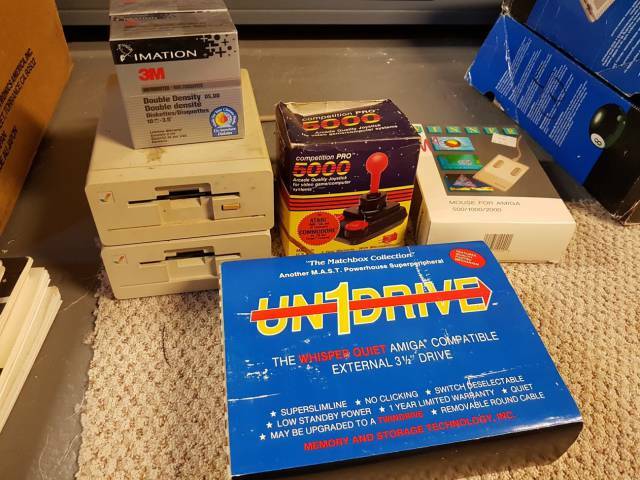 Came with some boxed games and various discs." 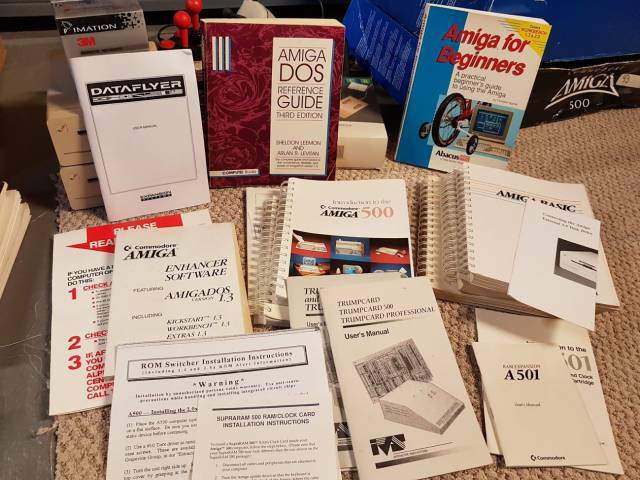 Even more manuals - "there are more Amiga manuals than there are computers." 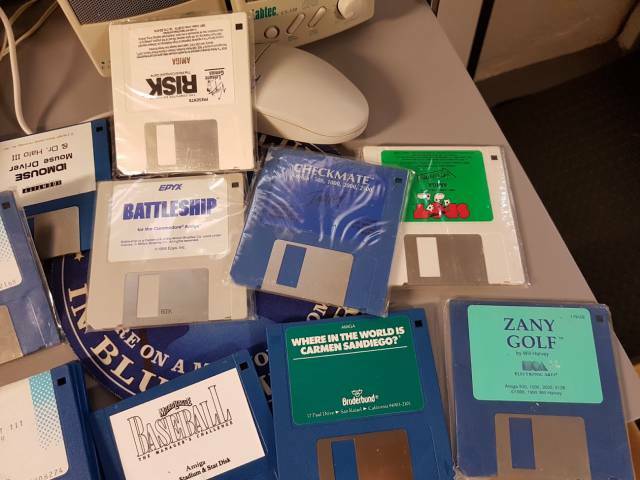 Various floppies including originals of some Sierra games. "Interesting. 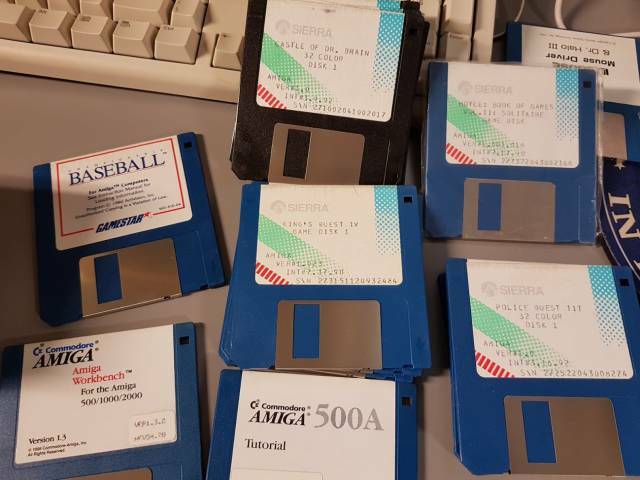 Haven't looked at what is on these yet..."
"Some more stuff. 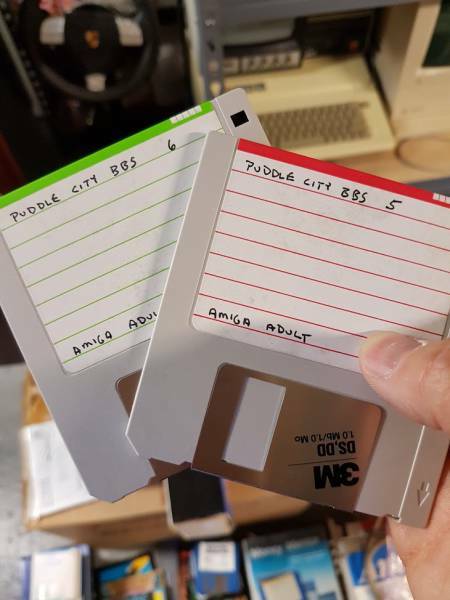 Two Amiga floppies and a generic external drive. 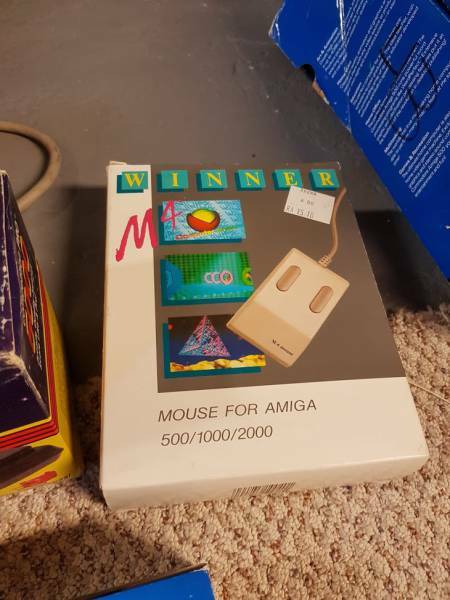 Boxed joystick and a funny 3rd party mouse. 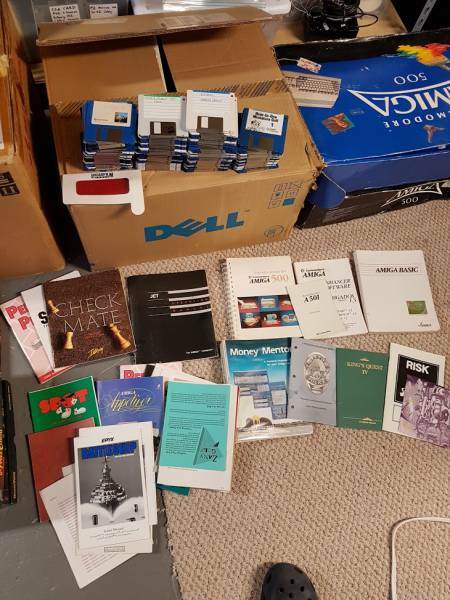 Also, two unopened boxes of floppies." Can this packaging get any more 80's? "These were just lose inside the box. 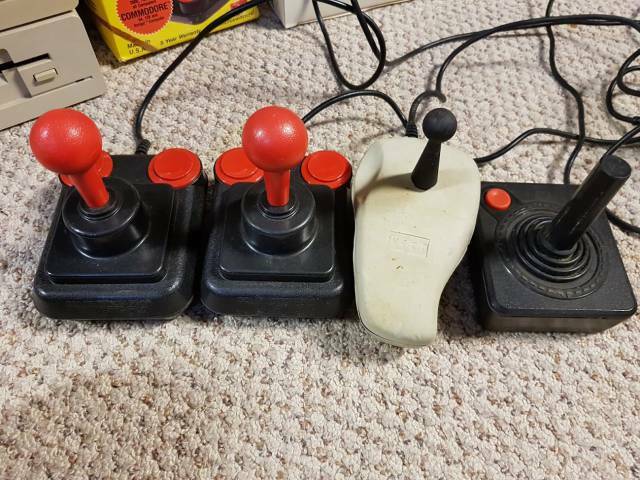 I had the second from the right joystick here -- and it sucked. Cramped up my hand after playing for a little while." 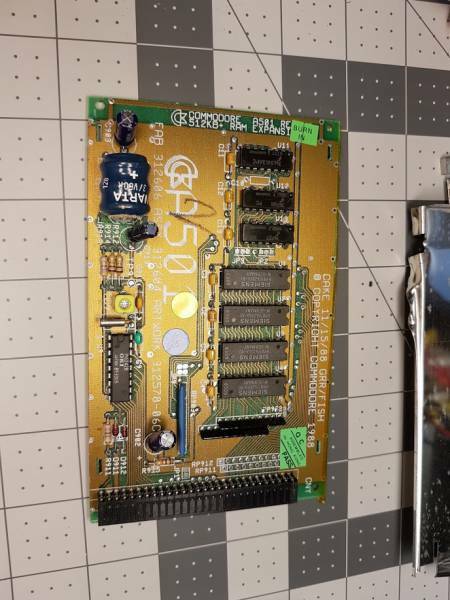 Amiga Genlock device for overlaying Amiga graphics on top of live video and the Amiga 520 RF modulator. 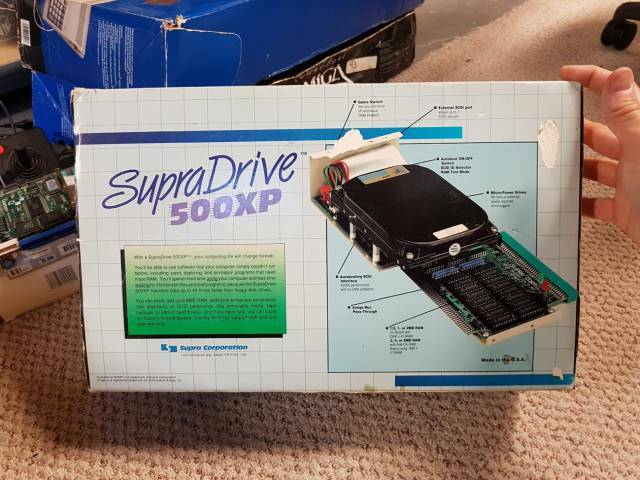 SupraDrive 500XP external RAM expansion and SCSI drive. "Neat. 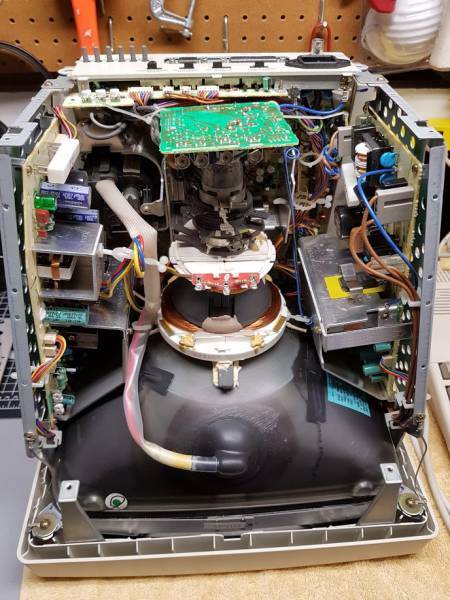 It has a hard drive installed into it -- don't know if it works anymore." 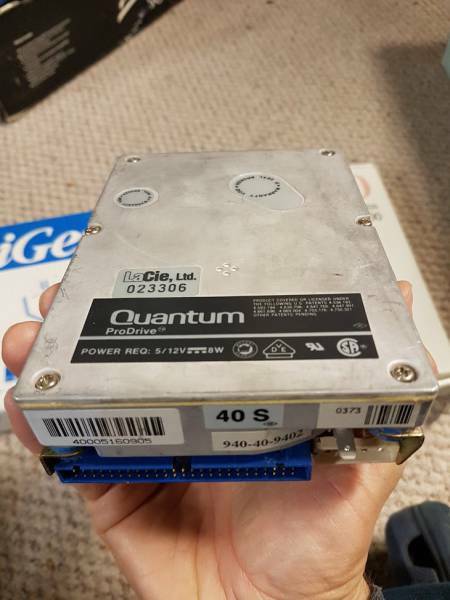 Random 40 meg Quantum drive included in the box. 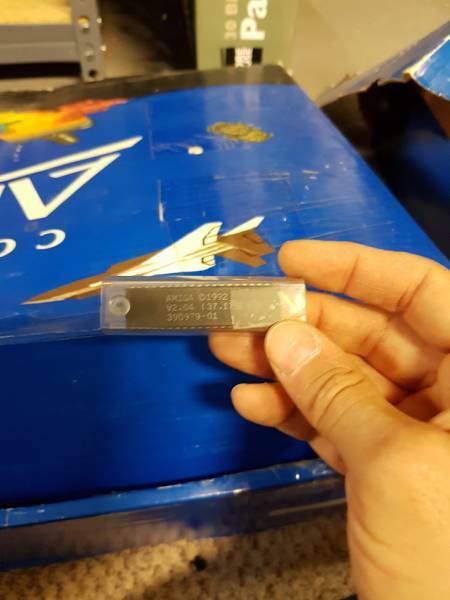 "A random Kickstart 2.04 chip! Nice." 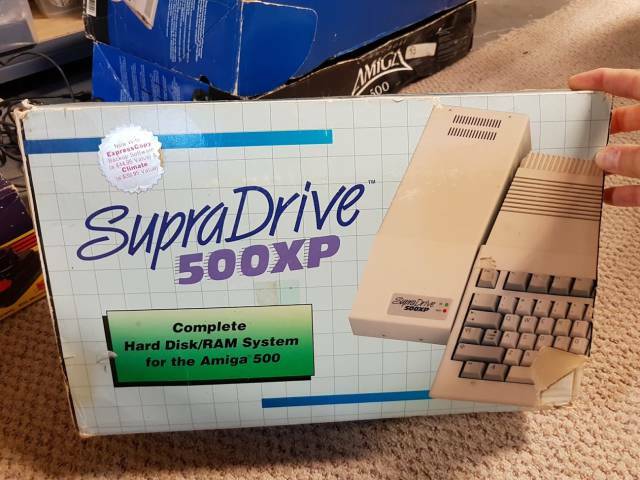 First Amiga. Power supply and mouse. "In great shape!! Just a little dirty and keys look pretty much brand new." 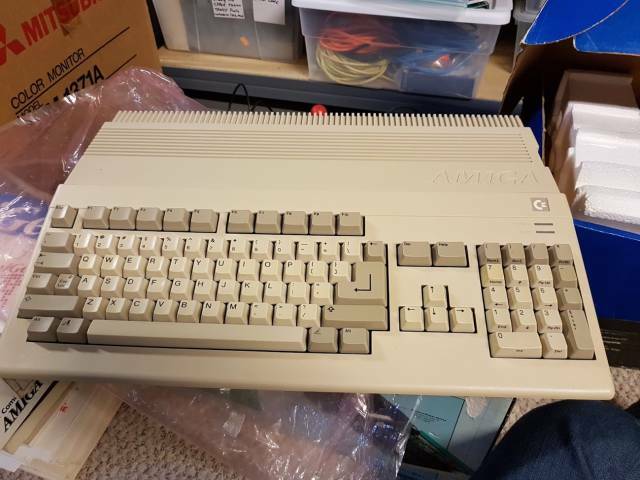 Second Amiga, also in great shape. Needs a minor clean only. 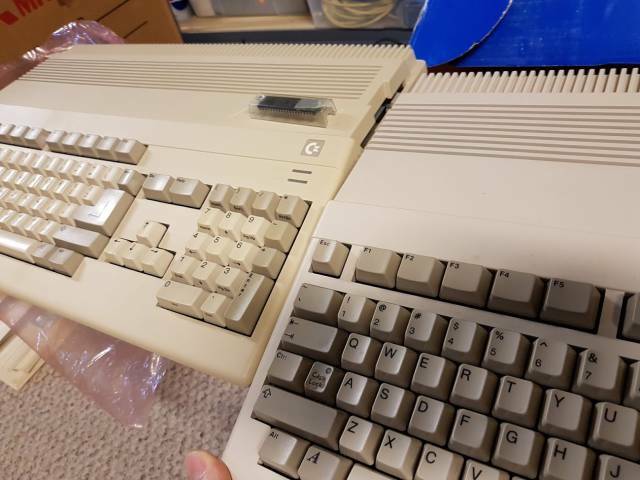 One is slightly more yellowed than the other for some reason. 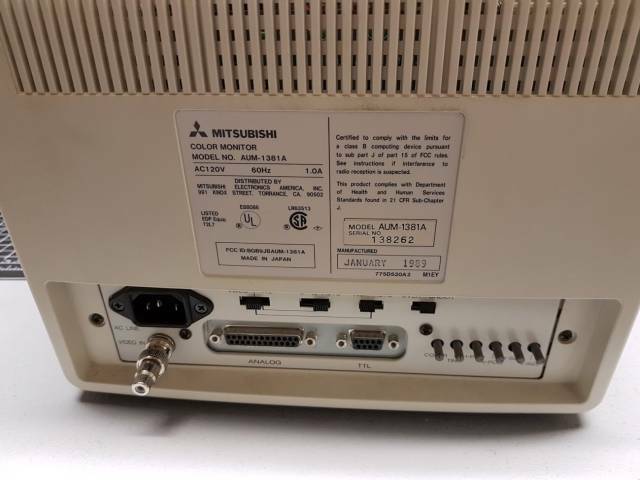 "Mitsubishi Multisync monitor AUM-1381A. 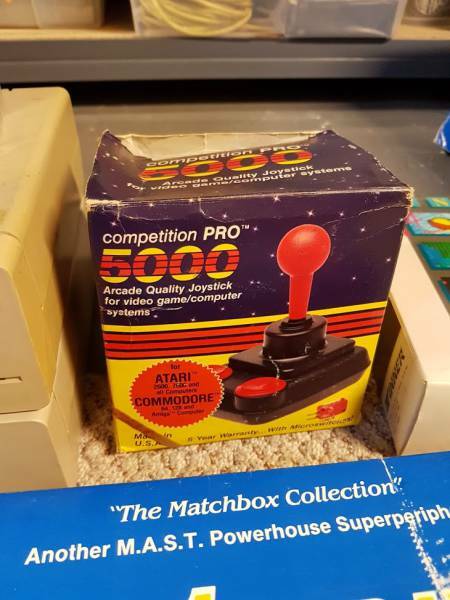 Need a little bit of a clean but in great shape otherwise. Has a Tilt-Swivel stand in the box which I need to install." Composite, Analog and TTL video. 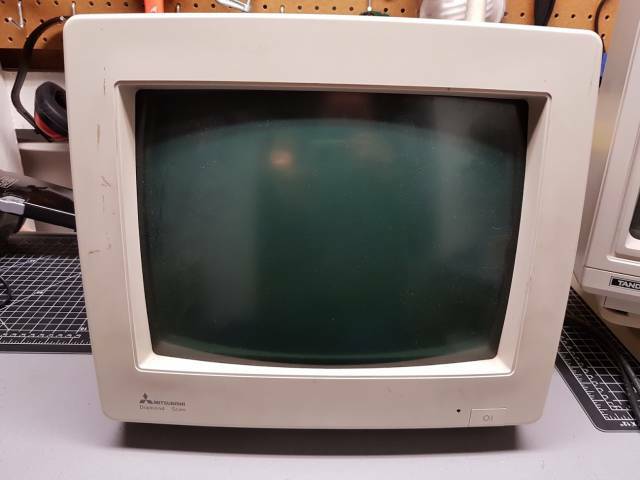 "This was a $900 monitor when new in 1989!" 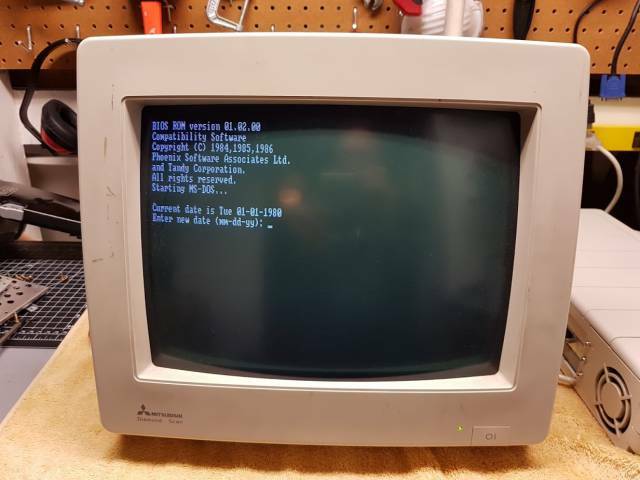 "Testing it with my Tandy 1000 EX. Works great with CGA. 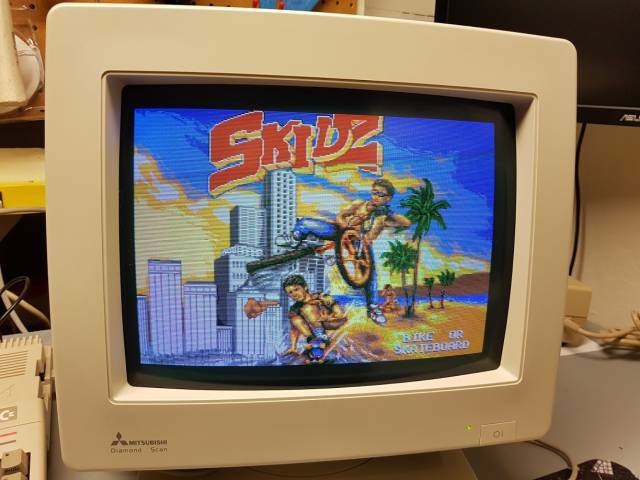 Reading the review from PC Magazine, it also supports EGA and Monochrome. It can support up to 800x560 resolution so I think it might do VGA too. (Will need to make a new cable.)" 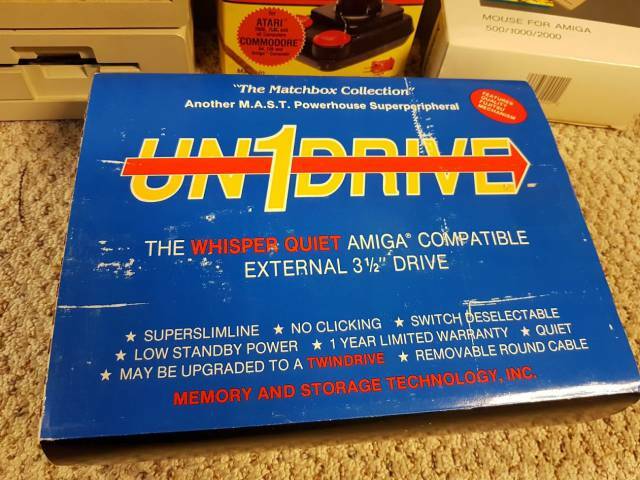 "Hooked up to the first Amiga. Kickstart 1.3. 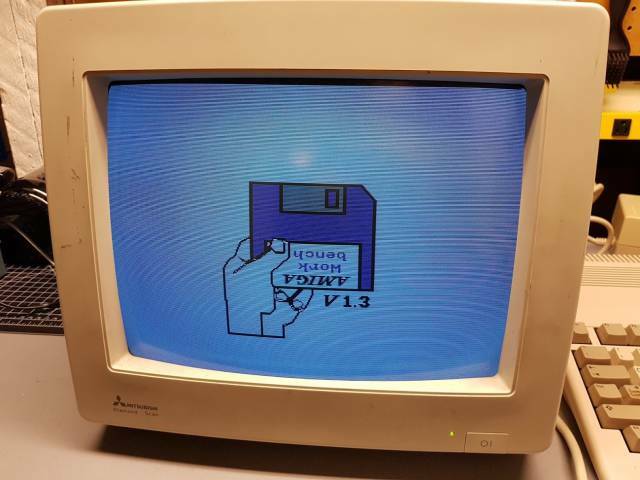 This machine has 1 meg of RAM. Need to check the trap door to see why the clock isn't there." 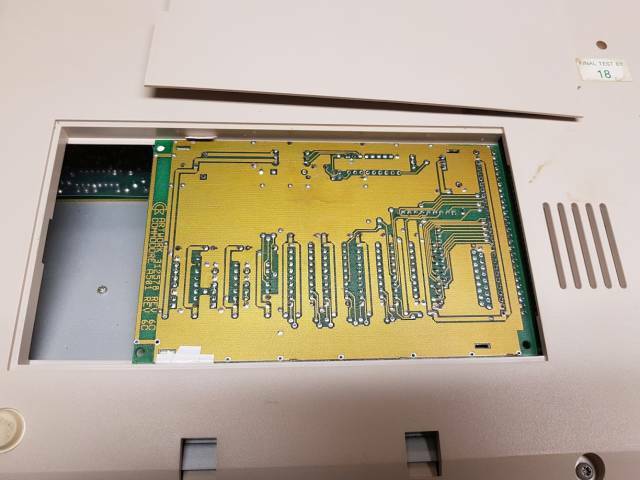 Second Amiga is Kickstart 2.0 and has 1 meg of RAM and a real time clock. "Monitor is all cleaned up. 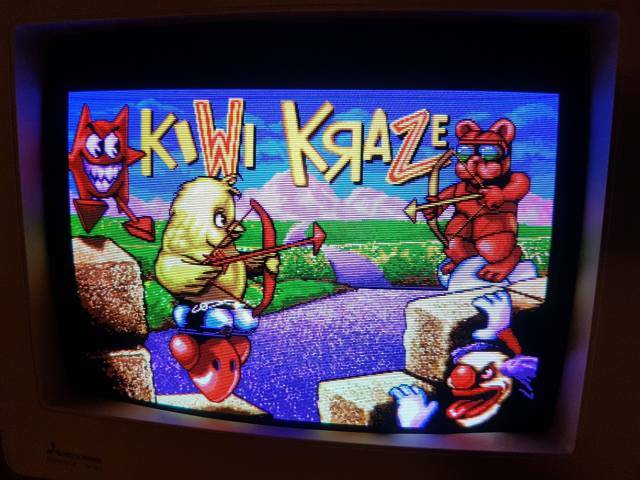 I tested this monitor with CGA, EGA, MDA (Monochrome) and Amiga 15khz analog video. All work perfectly! 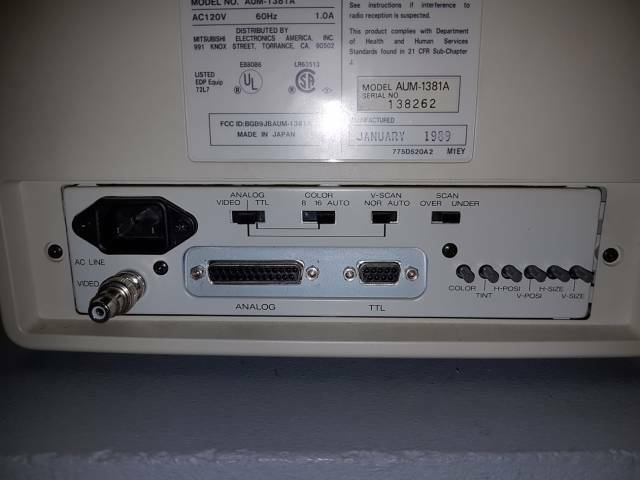 I found some info on it and it also supports 31.5khz VGA (640x480.) It is a real jack of all trades!" "Inside, it is super clean. It is very odd that the monitor is quite dim for some reason, even at max brightness. Doesn't appear to have many hours of run-time on it. I adjusted the G1 and G2 controls along with sub brightness and R/G/B cut pots. It made a huge difference now." "Trying out some random games it came with. Monitor is looking nice now I adjusted it." "Even under my bright shop lights it is decently bright. If I turn it up more than this it loses a little sharpness in the center from some minor blooming. 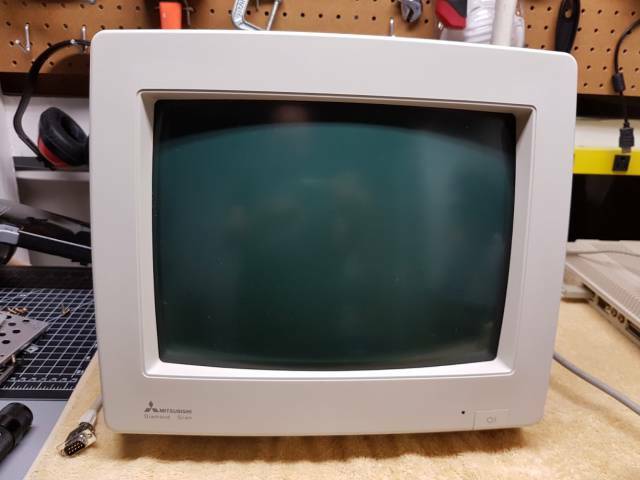 Considering the age of this monitor and the unknown history, it's in amazing shape. Not a scratch or nick on it." 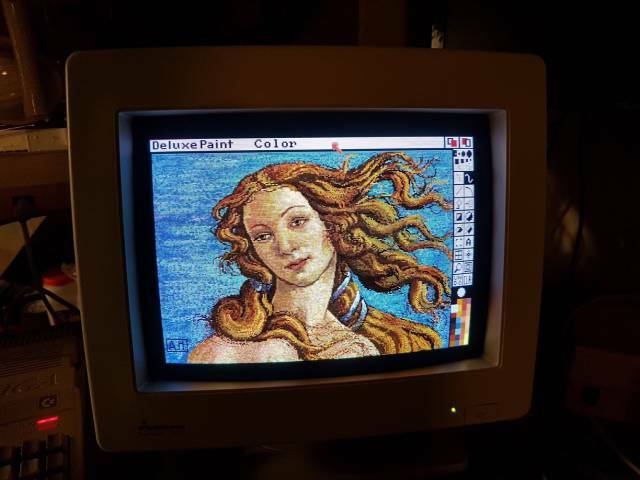 "I have the original Deluxe Paint III floppies including the art disc. It was a real nostalgic blast to look at the old classic files like Venus and King Tut." 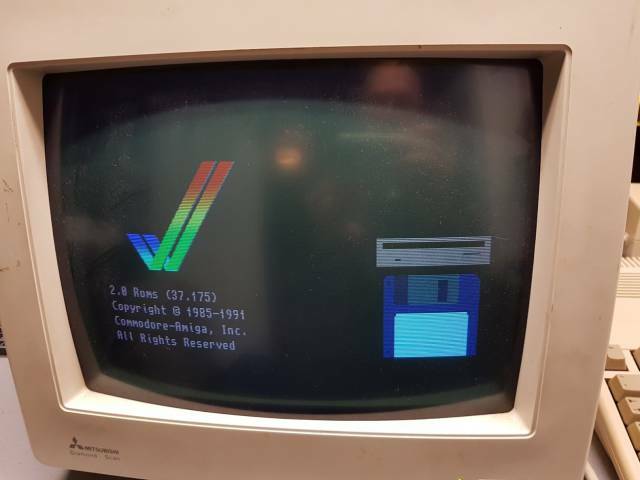 "Opening up the computer with the non working clock, it has the Commodore A501 RAM+clock board. It is encased in metal shielding so I cut that away to get inside." Yep, here is your problem! Ouch. 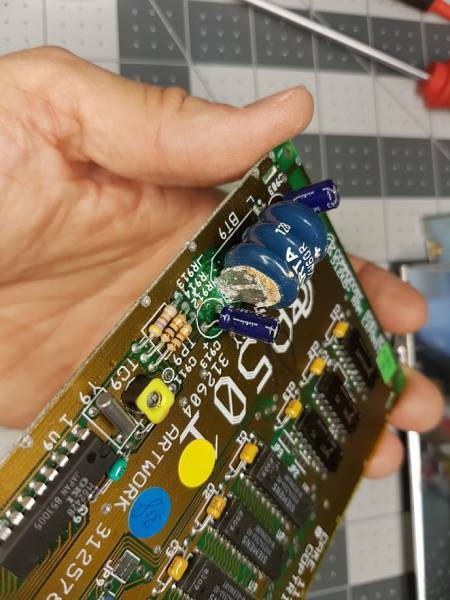 "The corrosion ate away a bunch of the copper but luckily it is just ground fill and one trace for the battery which doesn't do anything. I cleaned it as best I could with alcohol and a brush. Hopefully it won't corrode any more." 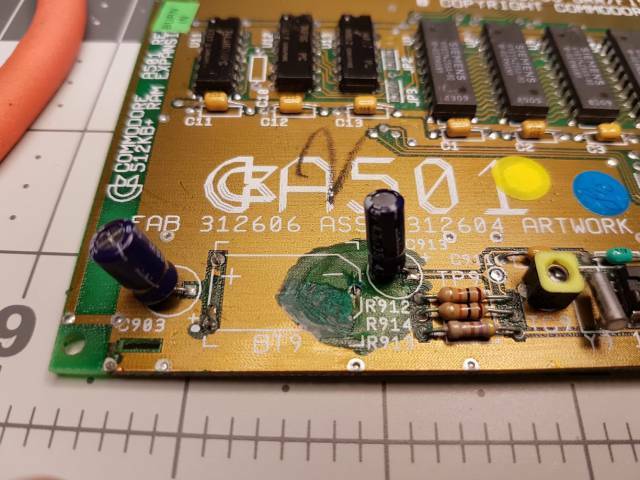 "The original battery is a rechargeable NiCD 3.6v -- so the board tries to recharge the battery when powered up. I replaced the battery with a salvaged CR2032 holder and battery and installed a diode to prevent charging of this lithium battery. 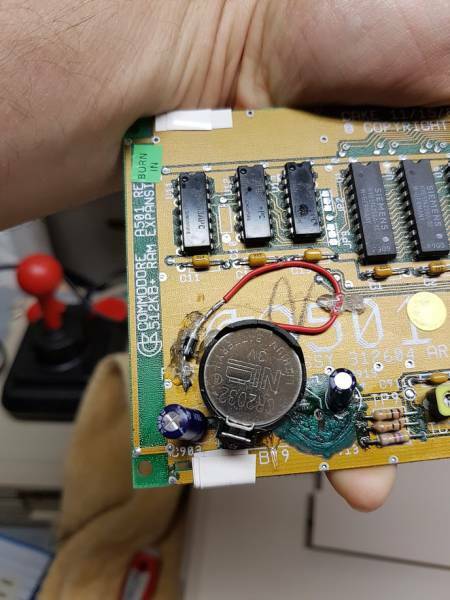 The clock appears to work perfectly with the 2.9 volts it gets from this CR2032 after diode voltage drop." Card installed back into the trap door compartment, without the metal shielding. "All set! 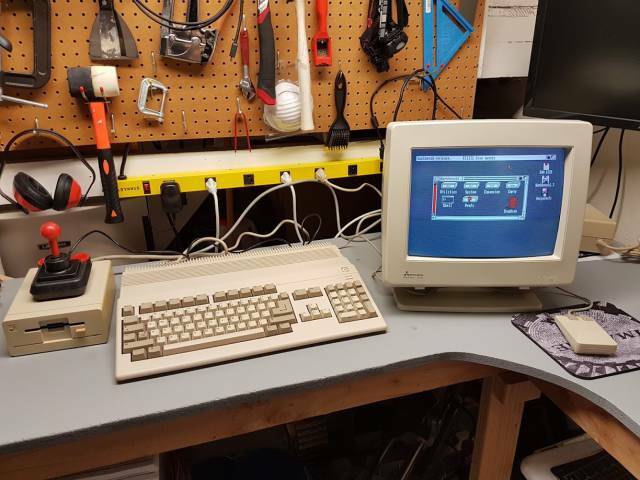 Here is Kickstart 1.3 machine (with repaired A501 board) all hooked up on my workbench. Awesome! AMIGA FOREVER!"